At 7.35 this morning, the Holy Father Francis departed from Ciampino airport destined for Alessano (Lecce), in the diocese of Ugento-Santa Maria di Leuca, and Molfetta (Bari) in the diocese of Molfetta-Ruvo-Giovinazzo-Terlizzi on the 25th anniversary of the death of H.E. Msgr. Tonino Bello. At around 8.20 he arrived at the “Fortunato Cesari” Military Airport of Galatina, from where the Pope departed immediately by helicopter for Alessano. Upon arrival, expected at 8.30, in the car park next to the cemetery of Alessano, the Pope was received by H.E. Msgr. Vito Angiuli, bishop of Ugento-Santa Maria di Leuca, and by the mayor of Alessano, Francesca Torsello. The Holy Father proceeded to the tomb of Msgr. Tonino Bello for a moment of prayer, and then greeted family members of the Servant of God. 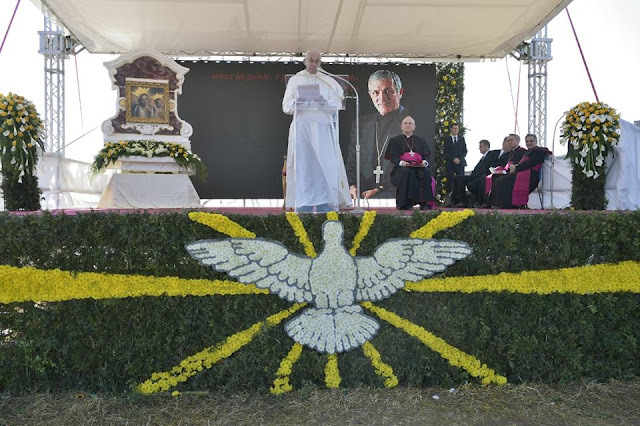 The Pope subsequently transferred to the square next to the cemetery for the meeting with the faithful. After greetings from H.E. Msgr. Angiuli, the Holy Father gave an address. At the end, he greeted a representation of faithful. At 9.30, the helicopter carrying the Holy Father departed for Molfetta. Understanding the poor was for him the true wealth, it was also understanding his mother, understanding the poor was his wealth. He was right, because the poor are truly the wealth of the Church. Remind us of this again, Don Tonino, when faced with the recurrent temptation to line up behind whoever is in power, to seek privileges, to get used to a comfortable life. The Gospel – you used to remind us of this at Christmas and at Easter – often calls us to an uncomfortable life, because those who follow Jesus love the poor and the humble. As the Master did, so His Mother proclaimed, praising God who “has brought down rulers from their thrones but has lifted up the humble” (Lk 1: 52). A Church that has the poor at heart is always in harmony with the channel of God, never loses the frequency of the Gospel and feels she has to return to the essential to profess consistently that the Lord is the only true good. Don Tonino reminds us not to theorize closeness to the poor, but to stay close to them, as Jesus did, Who for us, rich as He was, made Himself poor (cf. 2 Cor 8, 9). Don Tonino felt the need to imitate Him, getting involved firsthand, to the point of dispossessing himself. Requests did not disturb him, but it was indifference that hurt him. He was not afraid of a lack of money, but worried about the uncertainty of work, a problem that is still very current today. He never missed an opportunity to say that in the first place there must be the worker with his dignity, not profit with his greed. He did not stay with his hands in his pockets: he acted locally to sow peace globally, in the belief that the best way to prevent violence and all kinds of wars is to take care of the needy and to promote justice. Indeed, if the war generates poverty, poverty too generates war . Peace, therefore, is built by starting from houses, from streets, from workshops, where communion is shaped in an artisanal way. Don Tonino said, hopefully: “From the workshop, like the day from the workshop of Nazareth, the word of peace will come out that will set humanity, thirsty for justice, on the path of new destinies” . Dear brothers and sisters, this vocation of peace belongs to your land, to this wonderful frontier land - finis-terrae - that Don Tonino called “terra-finestra”, “window land”, because from the South of Italy one opens up to the many Souths of the world, where “The poorest are ever more numerous while the rich are getting richer and ever fewer” . You are an “open window, from which you can observe all the poverty that impends on history” , but above all you are a window of hope because the Mediterranean, the historical basin of civilization, is never a stretched longbow, but rather an ark of welcoming peace . Don Tonino was a man of his land, because his priesthood matured in this land. Here there unfolded his vocation, which he loved to call his evocation: evocation of how madly God favours, one by one, our fragile lives; echo of His voice of love that speaks to us every day; the call always to go ahead, to dream boldly, to decentralize our own existence to place it in service; the invitation always to trust in God, the only One capable of transforming life into a feast. So, this is vocation according to Don Tonino: a call to become not only devoted faithful, but to be genuinely in love with the Lord, with the ardour of the dream, the seal of the gift, the boldness of never stopping at half measures. Because when the Lord inflames the heart, hope cannot be extinguished. When the Lord asks for a “yes”, one cannot answer “perhaps”. It will do good, not only to the young but to all of us, to all those who seek meaning in life, to listen and re-listen to the words of Don Tonino. In this land, Antonio was born as Tonino and become Don Tonino. This name, simple and familiar, which we read on his tombstone, speaks to us still. It tells of his wish to make himself small to be close, to shorten distances, to offer an outstretched hand. It invites us to the simple and genuine openness of the Gospel. Don Tonino had greatly recommended this, leaving it as a legacy to his priests. He said: “Let us love the world. Let us love it well. Let us take it under our wing. Let us use mercy. Let is not always oppose it to the rigours of the law if we have not tempered them first with doses of tenderness. They are words that reveal the desire for a Church for the world: not worldly, but for the world. May the Lord give us this grace: a Church that is not worldly, in the service of the world. A Church that is devoid of self-centredness and “extroverted, outreaching, not wrapped up in itself” ; not waiting to receive, but to provide urgent care; never drowsing in the nostalgia of the past, but illuminated with love for today, following the example of God, Who “so loved the world” (Jn 3: 16). The name of “Don Tonino” also tells us of his healthy allergy towards titles and honours, his desire to deprive himself of something for Jesus who had divested Himself of everything, his courage to free himself of what could recall the signs of powerso as to give space to the power of signs . Don Tonino certainly did not do it for convenience or to seek consensus, but because he was moved by the example of the Lord. In love for Him we find the strength to dispose of the garments that hinder the passage to put us in service, to be a “Church of the tunic, the only priestly vestment recorded in the Gospel” . From this beloved land, what could Don Tonino still say to us? This believer with his feet on the ground and his eyes in Heaven, and above all with a heart that connected Heaven and earth, coined, among many others, an original word, which gives each of us a great mission. He liked to say that we Christians “must be contempl-active, with a “c”, that is, people who start from contemplation and then let their dynamism, their commitment to action, flow” , people who never separate prayer and action. Dear Don Tonino, you warned us against immersing ourselves in the whirlwind of affairs without planting ourselves in front of the tabernacle, so as not to deceive ourselves of working in vain for the Kingdom . And we can ask ourselves if we start from the tabernacle or from ourselves. You could also ask us if, once we set out, we walk; if, like Mary, the Woman of the path, if we arise to reach and serve man, every man. If you asked, we would have to feel ashamed of our immobility and our constant justifications. Give us again, then, our high vocation; help us to be increasingly a contemplactive Church, in love with God and impassioned about humanity. Dear brothers and sisters, in every age the Lord places on the path of the Church witnesses who incarnate the good news of Easter, prophets of hope for the future of all. From your land, God made one of them emerge, as a gift and prophecy for our times. And God wishes for His gift to be received, for his prophecy to come true. Let us not be content to note down good memories, let us not be harnessed by past nostalgia or even idle chatter of the present or fears for the future. Let us imitate Don Tonino, let us be carried away by his young Christian ardour, let us feel his urgent invitation to live the Gospel without half-measures. It is a powerful invitation to each of us, and to us as a Church. Truly it will help us spread the fragrant joy of the Gospel today. Now, all together, let us pray to Our Lady and afterwards I will give you my blessing, all right? «Grazie, Chiesa di Alessano», La terra dei miei sogni. Bagliori di luce dagli scritti ugentini, 2014, 477. Cfr Saint John Paul II, «If you want peace, reach out to the poor», Message for World Day of Peace, 1 January 1993. La terra dei miei sogni, 32. «Il pentalogo della speranza», Scritti vari, interviste aggiunte, 2007, 252. «La speranza a caro prezzo», Scritti di pace, 1997, 348. Cfr «La profezia oltre la mafia», ivi, 280. «Torchio e spirito. Omelia per la Messa crismale 1993», Lenten homilies and writings, 2015, 97. «Sacerdoti per il mondo», Cirenei della gioia, 2004, 26. «Dai poveri verso tutti», ivi, 122 ss. «Configurati a Cristo capo e sacerdote», ivi, 61. Cfr «Contempl-attivi nella ferialità quotidiana», Non c’è fedeltà senza rischio, 2000, 124; «Soffrire le cose di Dio e soffrire le cose dell’uomo», Cirenei della gioia, 81-82.